The day that only comes around every four years saw activity unabated by the leap function but no proposals have been notified to HQ. The whole line benefited from a track patrol in advance of our first scheduled passenger weekend with many fishplate bolts tightened and level crossing gate checks made. The PWT also changed 13 sleepers on the Gorsey Bank to Idridgehay section reaching the area of Milepost 140 in their endeavours. Mick ably hosted a second day with our customer who was inducting Network Rail surveyors into to the use of their equipment. The Second Open Pullman is now complete and John commenced preparation of the First Open in advance of its entry to covered accommodation Sunday afternoon, all being well. The Lone Carriage Cleaner tended to dmu 50170 with an assistant today who dealt with any screw head not properly aligned but, most importantly, dealt with the interior book shelf and main window area of my office. "I can see, I can see". The Head of Gardening was in action on the Wirksworth station garden slightly complaining of the cold as the temperature soared. Negotiations were satisfactorily concluded for the arrival of a large yellow machine to arrive on Sunday from Sweden and we look forward to working with their team throughout March. Activity on the Bubble Car continued and I anticipate the end product will be a world beater. The Booking Hall proudly captured another group booking and the BuyaGift products continue to yield revenue and tasks for us in the forthcoming months. Another bumper Tuesday with the delight of welcoming a return customer who had a demonstration day of their surveying equipment to representatives from Network Rail. Happily this work will continue tomorrow. The LMSCA continued with the work to refloor the BTK 27001 and tested new securing bolts that will fix the floor to the underframe. These tests were deemed satisfactory and three panels have now been laid. The DST conducted a steam test with contractors on No3 which was declared successful with no leaks allowing for a visit of the boiler inspector to sign the loco off for the coming year's demands. The rest of the team continued their endeavours with Henry Ellison and Cathryn. The VCT had a large turnout of eight members allowing for a probable record five fire day some quarter of a mile south of Old Lane bridge.The PWT changed a further 25 or 26 sleepers, depending on who was counting, south of Ken Rowlands crossing and Mike the Flail gave the Up (east) side a haircut between Gorsey Bank and 40 Steps concentrating on the sight lines around the footpath crossing. The Buffet Car and Bubble Car received further attention as each project inches towards completion. Equally the DTT made steady progress at Duffield and a degree of housekeeping was achieved with litter picking and Mess Room painting. The Buffet Car project benefited from the attention of Geoff Adams who hauled away the surplus timber and skipped any surplus metal. Angela held a meeting with her seasonal catering team who were suitably enthused by the developments and were able to visualise the end product. The Booking Hall achieved the inevitable admin tasks and thoughts are turning to how we might create a booking facility at Duffield. Negotiations intensified with the imminent arrival of a large yellow machine next Monday. The Filing Fairy intensified her pressure on errant paperwork and those responsible for delivering it - you have been warned! PS - There will be a memorial service for Fred Morton at St. Katherine's Church, Rowsley at 1200 on Thursday 8th March, following an earlier private cremation. suspension of the station bike. which has been franchised by the government to ASDA. A busy day with many many volunteers on site. A Drive a Diesel guest was entertained on his surprise experience, having lunch in the Training Room. The DMU team split in half with some returning 51360 to traffic and some moving onto Phase 2 of the restoration of 51505. 51188 was put on the pit ready to receive attention to a leaking flywheel and a 2-car was constructed ready for the first day of the season next Saturday. Work also continued of the bubble. The LMSCA worked on the floor in the Brake Third coach. No3 was steamed to check all is good for the season and work continued on the LMS brake van. The 8F group were in attendance. The Passenger Dept painted the buildings to lift their appearance for the new season. Not a bad day for progress but spirits severely dampened by the sad news of Fred Morton's passing. It is with great sadness I have to report the death of Fred Morton this morning. He had been battling with cancer for some time but maintained his interest and affection for our affairs. A man with a tremendous knowledge of steam and diesel locos together with diesel multiple units and I know he enjoyed his driving turns with us. Our main event today was to host the RAIB on a training day which was ably hosted by Mick T. The Buffet Car project moved forward with some of the plumbing now installed and preparation for the vehicle's movement tomorrow that will allow installation of the underfloor pipework to be manufactured and installed. 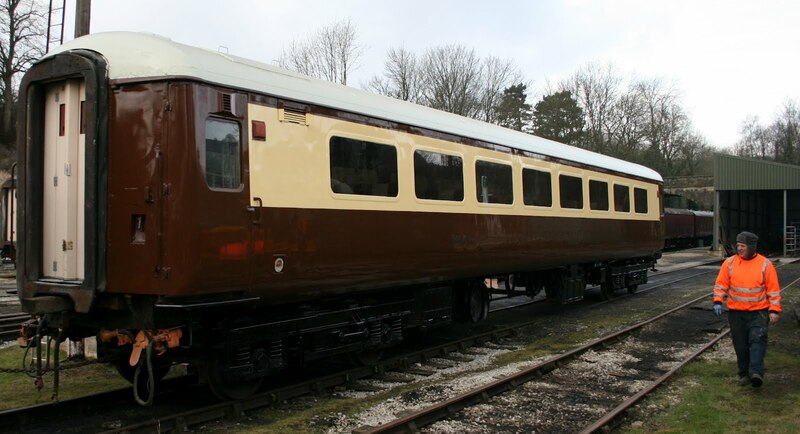 The Second Open has had its final coat of Umber and will be released into the world a week on Monday where we hope to enable our two ex Gatwick Express vehicles to be marshalled into a "set" that can travel as well as support our catering ambitions. This involves physically turning them on the back of a customer's vehicle scheduled to be delivered then. The Class 33 team were out in force and seem to have resolve a variety of faults ready for its staring role in March. The Booking Hall received visitors and continued exterior painting as the weather was remarkably kind to us today. Another day that stretched, or sweated, all our resources.Yesterday's road/rail customer satisfied the Vehicle Acceptance Body that their machine could do all that was necessary on the Tyne and Wear Metro and their representatives were on site to see all was well. Our second customer of the day was new to us but, inevitably, contained a familiar face. All the activity centred on the Incline and they declared they had a most productive day. Eric looked after Customer 1 and Mick T looked after Customer 2 and I am most grateful for this. Customer 2 was lead by a native of Barnsley and there was something of a Barnsley fest as our Mick hails from that Town. John completed the cream on the Second Open and the bogies and solebar were transformed by the application of gloss black. The unpleasant part of this was the removal of the products of the track discharge toilet. The jumper cables also had their first coat of orange and the overall standard of finish is quite spectacular given our primitive conditions. The Buffet Car project continued with materials being sourced and a sink unit changed. The PWT were banished for the day to the area around Ken Rowlands crossing and achieved 10 sleeper changes and the replacement of a cracked fishplate. I also failed to report yesterday that further cleansing of the Shottle site warmed the bodies of those participating. The VCT were also unimpeded today and made further inroads to the lineside vegetation south of Old Lane bridge. The dmu team resolved the defective handbrake on 51360, fitted a new desk piece into the vehicle and renewed the brake blocks on the north end bogie. The Bubble Car project also benefited from another piece of steel let into the roof area. The DTT worked solidly through the week with a cut of the adjacent concrete plinth to allow one of the new doors to open satisfactorily, completion of most of the internal boarding has been done and the linings around the doors resolved. The unsung team of two are working wonders on this building and it is anticipated that tiling will start next week. The Booking Hall continued to keep the forward bookings up to date and Anton, brought out by the warm sunshine, continued with the painting of the exterior of the station buildings. Many compliments have been received about the new webcam pictures and there is still an opportunity to see more of these little wonders by following the PayPal link on the web site. Remember it is not only the acquisition of more cameras but the application of the dedicated twosome that ensure they are hauled up poles and work for your pleasure. This is the second attempt as the power keeps going on and off, it's like living in the third world, after visiting the Malt Shovel for a post endeavour reviver where the Scottish product is gravity fed thank goodness. However, onwards and upwards before my ramblings are destroyed again. Two customers today, the first accomplishing vibration and noise testing on a road/rail vehicle for the Tyne and Wear Metro and the second demonstrating a new trolley under the watchful eye of London Underground. The team of Mick Thomas, Lewis and Eric Boultbee looked after these welcome visitors very well and Eric's first experience of MTT was certainly an eye opener. The PWT were banished to Shottle and achieve some 26 sleepers drilled, plated and spiked for the lop project in the most miserable of conditions. John is on the last lap with the Second Open with completion expected next week to allow the First Open to be processed through March. The Buffet Car renovation benefited from some extra pairs of hands as the completion date of mid March rushes towards us. The Lone Carriage Cleaner tackled the interior windows and trim of the two car set with some advice and guidance about aligning the screws. She coped with this without batting an eyelid - this woman is a saint! The Booking Hall and reluctant computer boffin achieved great progress with the restoration of the first web cam to be replaced. The end result is now visible on line - unless the power cuts have switched it off again. As previously reported, the old webcams which served us so well for nearly 10 years expired a few weeks ago. I am now pleased to announce, thanks to generous donations, that we have been able to purchase and set up the first of our new cameras. The model we have chosen is specifically designed for outdoor use and provides a very high quality image to 720p high definition standard which will hopefully give us another 10 years of good service. The image served to the website is slightly compressed as our "pipe" isn't quite big enough for full high definition but we hope you will agree that the new image is much better - bigger, sharper and more colourful. Please visit http://www.e-v-r.com/webcams to take a look at the first of the new cameras and don't forget, if you like what you see, please click on donate to help us raise the money to purchase more! I really should not be amazed at the Tuesday endeavours but again our teams have exceeded all expectations! The VCT continued their splendid work in the area of Old Lane Bridge and anyone driving past this area on the Wirksworth to Duffield road will see a whole swathe of our Railway exposed to the unknowing public - a really first class job with a two fire day. The PWT also had a most productive day with replacement sleepers discharged into areas defined yesterday by Mick between Gorsey Bank and Idridgehay and two and a part wagon of logs loaded for return and sale at Wirksworth. A most productive and quite tiring day. The Buffet Car project inched forward as the deadline for reopening gallops towards us and Fred & Iris gave the Mess Hall a much needed deep clean. The Filing Fairy was in go mode and the Filling Fairy's husband continued very valuable work with the track recording machine to verify the data produced last week. The LMSCA were out in force needle gunning and priming 27001 ready for the floor to be restored to the vehicle. Mike the Flail tackled the area between Jebbs Lane and Barnsley Lane returning the Komatsu to Wirksworth where it is required later in the week. The Booking Hall continued to process enquiries for future trade including a Saloon opportunity from Spain. The DTT also made solid progress with some of the fittings attach to the walls and something else which has escaped me! The memory may come back tomorrow. Another great day and I am grateful to those of you who have contributed to the restoration of the webcams which I hope will show you some progress as the week progresses. PS - I was good to see Graham Akers visiting us today from the Isle of Wight and he left me with a delightful framed photograph of 78019 entering Wirksworth - it seems such a long time ago now! Buffet and Third Class will be Pullman Bap-o-rama. can make a cup of tea there. their garden with our compliments. The main item on the agenda was a shunt in the yard to position everything in useful places ready for upcoming goings-on. This was undertaken by a team and took all day with the Class 20. It was useful for a gaggle of new guards who were under training to observe what was taking place. The DMU team worked on the interior of the Class 119 with the varnishing of internal window surrounds and the fitting of more laminate in order. Bodywork on the bubble car continued too. The 8F group continued working on the boiler of Henry Ellison. Bridge contractors spectacularly abseiled Cemetery Lane bridge to check on the structures condition. All seems to be in order. A gentle day with John ploughing a lone furrow as he rearranges the interior of the Pullman Buffet Car and Dan continuing the Bubble Car renovation. Anton manufactured steps so the stride into the new Information Room is lessened and also dealt with a number of bedraggled parents and children looking for something to do on a most unpleasant day. The widespread announcement that the East Midlands is a drought area had the desired effect of causing it to rain all day. Planning for next week's flurry of testing customers was concluded. Much of the day at Wirksworth was taken up by a major shunt to move the Second Open from one side of the Maintenance Facility to the other so that the painting can be completed. All shunting is neither simple or swift and today's activity was hampered by the defunct L J Breeze and the peculiararity of the Second Open that it only has a sensible coupling at one end. Nonetheless the task was achieved and the attached photo shows the splendid East side and the man who has done all the work, John Allsop. The PWT quietly continued their work on Shottle loop with a further panel of track fully completed. More lineside debris was disposed of and some rail unloaded ready for more progress there. The Buffet Car is noticeably changing inside as the back panels for the new units are installed and you can begin to envisage the end product. There was a paint stained Anton who deposited some of the product on the exterior of the Booking Hall and the VCT made impressive progress in the Old Lane bridge area with a three fire day again. The sticking handbrake on dmu car 51360 was finally released after a great deal of effort causing those involved to be very black which I am told is character building. When the Second Open had moved the Umber Gloss was largely completed with the Lancastrian Cream to be applied to the West side next week. The Booking Hall was kept busy and updated the Catering section of the web site and had a further electronic push at the Diesel Weekend. A little less frenetic today but more solid progress achieved. Rails were loaded to the Sturgeon from the Gorsey Bank line and shipped to Shottle for unloading at a later date. The team filled a further two wagons with logs and deposited them in the Car Park at Wirksworth for sale. The other part of the PWT completed one more panel of track at Shottle and laid out the sleepers for the next panel. Further tidying of the Shottle site was also accomplished. The DTT concentrated on general building work and the Buffet Car received lots of material for its interior fittings together with much cutting and shaping of the new worktops. The lone Carriage Cleaner was joined by her son and heir to give the two car set used on Saturday a good do and bring the Training Room back up to standard. The Booking Hall combined with our computer expert to try and resolve our webcam problems but it is confirmed that the extremely low temperatures have killed them off. Investment in their replacement at around £1000 is a bit beyond us at the moment so the watchers will have to bear with us or send a cheque in payable to WyvernRail plc to speed replacement. David Gratton who has been quite poorly has improved after major surgery but remains in the Royal Derby Hospital for a little while longer. Valentine's day saw another huge turnout before the teams bought their partners all the necessary ingredients for a pleasant evening, or I hope they did and live to tell the tale. Duffield had the attention of bargeboard painting on the Mess Hut and some trial renovation of the interior together with the manufacture of improvements to the Hut's security. The DTT reported that all drainage is connected to the new toilets which is another achievement in this most important of our pre-season projects. The other vital pre-season work is the revision of the interior of the Buffet Car and this is really gaining pace. Many thanks to Eric who gave the working area a very deep clean before the new units are installed and to John who put in a very full day in an attempt to complete the work on schedule. The VCT continued their endeavours south of Old Lane bridge, DJW 11, and the views of the Railway from the main road are spectacular opening up some delightful photographic opportunities that haven't been available for, maybe, 60 years or so. They had a splendid 3 fires and exposed yet another culvert under the Railway which will exercise our Asset Manager as it is nearly silted up. The PWT set forth to change sleepers as the weather moderated and changed 18 in the area of the sewage works bridge north of Ken Rowlands crossing. The Track Recording Trolley had an intensive day as its performance was calibrated against a known distance and physical track gauge and twist measurements. The trolley was confirmed as highly accurate and a run on the Incline was achieved with the results to now be analyzed. The DST reported the Henry Ellison's injectors were completely fettled and the associated pipe work straightened ready for their fitment once the boiler and tank return to the chassis. Work continued to ready the boiler for testing by the Inspector. The Filing Fairy became more aggressive as she homes in on errant record keeping so necessary to our continued existence. I am sure those of you involved know there is no escape from this whirlwind. The Bubble Car work continued unabated and the Second Open had its final coat of gloss Umber on the East Side and first gloss Umber on the West side. Movement of the coach on Thursday will allow the West side to be completed. Flailing took place in the Jebbs Lane area and the race is on to complete the whole line before limitations on this activity start in early Spring. The Booking Hall had a morning of bring the accounts up to date and the afternoon progressing the enhancement of the Idridgehay raised platform area. Our international status was confirmed by a further purchase of shares by our member in Cape Town and an email from Nova Scotia enquiring when the web cams would be on line again - a problem that is occupying some time to resolve. The Buffet Car interior remodelling is really getting into its stride with much expenditure on fixtures and fittings made possible by the response to our last mailout to shareholders. The Bubble Car also received further attention during its major bodywork repairs. The Booking Hall fielded the usual phone calls and, achieved each Monday whilst manning the post, John completed the past week's analysis of volunteer hours. There is a pleasant attachment to this report shown to us by one of the participants of Saturday's HRA visit. Within the document is a description of a rail tour in 1955 by the Gloucester Railway Society that included Wirksworth in the programme. There are details of the locomotives used that includes classes sadly lost to preservation and the rolling stock which will make the LMSCA drool. Neil was able to scan the document during Saturday afternoon and return the original to its owner Saturday night. We also have news of Mike Craft who is back home after his knee operation as is Joe Ruddock after a hernia operation. Both are doing well and poised to return to duty! A slightly damp rather than perishing day here in the Gem of the Peak. return this vehicle's interior to its original joy. In addition to the words from Martin, here is a summary of other progress. The DMU team progressed on several fronts. Work to get to the cause of the faulty handbrake on the 117 progressed with further stripping down of the area around the handbrake column. A difficult task as everything is awkward to get to! Behind this, work progressed on the body panels on the bubble car with rust treatment being applied to cab areas that haven't been replaced and new metal being added to the top. A third front, and possibly the most exciting, is that the Class 119 had the newly wired throttle and gear controllers successfully tested. This is the first time the cab controls have worked in this vehicle since 1993 (some 19 years)! This is a major morale-boosting step forward. Elsewhere, the Passenger Department took the opportunity to do some staff refreshers on various roles that they perform, ready for the new operating season to begin at the start of next month. A supplementary note to the usual day's report reflects my admiration for all the efforts made to welcome delegates to the Heritage Railway Association AGM weekend. All the preparation work done by many during the previous few days paid off. The delegates started their day with East Midland Trains 0950 Derby to Duffield and who had ensured the train was a 2 Car. Our two car train left Wirksworth to collect them from Duffield, not without its moments after the coldest night of the year, drawing in to Duffield just as the party were arriving at our Platform. Ben starred with a welcome trolley service as we made our way to Wirksworth where the miniature and narrow gauge railways were in operation together with Iris operating to Ravenstor. The Museum, EVRA Shop, Booking Hall and Model Railway were also all open and refreshments were served in the Training Room. The Class 33 team were able to show off their steed as well and tours were arranged to show life behind the scenes. At 1215 prompt the party departed for return to Duffield and the 1302 EMT Duffield to Derby, again with 2 Cars. The whole visit demonstrated our Railway at its best and everyone involved can take a bow. These pleasant occasions do not happen by chance but if the preparation work is done have a good chance of success. Comments made by all the participants were most complimentary and we may have had the first visit to our line by a "Lord" as Lord Faulkner lead the HRA team. Arctic conditions again reflecting huge credit on all who turned up for a variety of tasks. The PWT decamped to Shottle and cleansed a further 200 metre of loop track bed, finalised a panel of track and disposed of more trackside debris. The dmu team responded to the challenge of the forthcoming weekend ensuring the two car set was ready for its Duffield excursion and Iriis was ready for its Ravenstor runs on Saturday. The EVRA shop has been tastefully rearranged for the weekend as well and further progress has been made with the "Bubble Car" and the Second Open. The reconstruction of the Buffet Car interior has inched forward and the DTT has received a vast quantity of material for the toilet project. Special thanks to Tony Watts who has donated the necessary light fittings and the equally necessary "vacant" and "engaged" toilet door locks. It's amazing what the Watt has in his garage. A special thanks to John Evans who has done an amazing amount of gritting and salting of the routes to the Training Room, Museum, Platform 3 and Ravenstor Platform. However, he did reveal his (tax free) pension that allows him a lot of endeavour. The dmu team are to be commended for all their work to ensure Saturday's trains are ready to roll so that our guests are warm and welcome. The Booking Hall continued to field a high level of calls as we march on the consciousness of the wider world. A special mention of Mike Craft who entered the portals of the Royal Derby Hospital for the replacement of his right knee joint today. As far as we know the operation was completed and all is well. No doubt he will command his empire from the wheelchair for a few weeks. Also, David Gratton, who many will have seen racing up and down the Car Park in his buggy, has been hospitalised and we await news of his progress. I am sure you will join me in wishing these stalwarts a speedy recovery. 2.00pm in the Mess Room Duffield. Another most impressive turn out in the most unpleasant conditions where any personal extremities are at high risk. The Filing Fairy and I bonded in a clerical atmosphere leaving husband of Filing Fairy to accompany today's track patrol. This was achieved on foot for the Wirksworth to Ravenstor section and the de luxe Landrover for the Wirksworth to Duffield section. This was not without considerable effort as the Track Recording Trolley was propelled by hand ahead of the Landrover from Shottle to Duffield. The cold affected the paper read out and we hope the storage chip has retained all the necessary information. During the patrol the flangeways at our two level crossing were cleared in advance of a charter train on Saturday. The remainder of the PWT continued to develop Shottle loop with some difficulty but a further two panels of rail have been prepared and the process of tidying up redundant sleepers was achieved. John continued Pullmanising, a new word, the Second Open and a photo is attached to give a clue how this work is progressing. Not an easy location for good pic. The EVRA shop modifications continued and the Museum is presentable for Saturday. The Booking Hall fielded an ever increasing volume of phone calls and we were please to welcome Phil Tarry back for a fix of his favourite Railway. Again, grateful thanks to all who turned out in the most unpleasant of conditions. We are still in the grip of a winter chill and unmoving snow. Nonetheless productivity was fairly high with John Evans clearing pathways and platforms at Wirksworth and Duffield with a judicious application of salted grit. The PWT, frustrated by the conditions that prevented sleeper changing, moved to Shottle and spiked up a magnificent 83 sleepers. The VCT responded to a reported overhanging branch near milepost 134 1/2 and then moved on to the Old Lane bridge area, between Idridgehay and Shottle, clearing further vegetation on the Up side with two large fires to burn the brash. Work continued with the Bubble Car makeover with more door welding and the DST concentrated on Henry Ellision with attention to the boiler and valves. The EVRA shop expansion moved on and the LMSCA had the unenviable job of needle gunning the underframe of 27001and painting it as they moved forward. The DTT made further strides in the construction of these new facilities and the Buffet Car has benefited from a deep clean of the new catering area together with a visit to suppliers that will deliver the necessary materials for the new counters. The Booking Hall team, Anton, spent a lot of time on the two car set being used for Saturday's charter and tending to general administration. Some 30 people in action today in the most unpleasant of conditions and I have great appreciation for their dedication. Unusually for this time of year there is a Monday report reflecting the quickening of pace as we approach the new operating season. With the help of Bob Swepstone and Mick Thomas we have been able to further progress a mytesttrack contract that will occupy us for the month of March. As this exciting project crystallises the impact on our other activities will be announced but it all looks good and most productive so far. Work continued to restore the fire damage on the Brakevan that houses our lamp display and the reconfiguration of the interior of the Buffet Car moved forward with much equipment for the project being sourced and delivered to Wirksworth. The Monday Booking Hall clerk fielded the usual enquiries and recorded messages. PS - Many of you will be aware that Network Rail have funded a most detailed inspection of all our structure by contractors. The results of these inspections are being fed in to us with a requirement that we undertake follow up action. Bob Swepstone has very kindly undertaken to represent the Company as Asset Manager as we come out of the comforting umbrella of Network Rail to the responsibility for our own destination. Most of the resulting work is quite minor and is of a care and maintenance requirement. Bob would like to see if anyone out there is interested in becoming part of a new team! The BPT, the Bridge Pointing Team. Let me know if this brand new opportunity is for you. As I say to many of the restorers of coaches and locomotives who don't participate in Permanent Way or Vegetation Clearance - no track, no trains. The same applies to our structures, no bridges, culverts, retaining walls etc. - no trains. Please give the matter some thought and see if the cosmetic restoration of our beautiful Midland Railway structures is for you. that they spent the day toboganning around the Chevin Golf Course. ready for a charter next week. restore water to the Mess Room and the Staff Toilet. -8 this morning on the way in to Wirksworth and it felt the same all day. Work to finish 51505 ready for next weekend continued with just a few odd jobs that became evident from yesterdays test run being carried out. Other members of the team started to investigate the problems with the handbrake on 51360, before declaring it too cold. I suppose skating in the pit doesn't help. Some work was carried out on the bubble car body work. Down at Idridgehay, work to put up the new raised platform extension began. An early finish today with snow falling heavy in Wirksworth. A day where the temperature was in negative figures all day. Wait, no. Today significant progress was made. The DMU team performed a successful test run to Duffield of E51505 concluding the first part of the refurbishment. This was a very useful exercise as the vehicle hasn't moved out of the yard since May. It was at Duffield where they sampled the chips. Work continued on the bubble car bodywork refurb. The Pioneer Diesel Group have accomplished one of their main missions on 33035 today. Late in the afternoon, with the temperatures freezing off their fingers, they stood back tentatively as they started up the Sulzer engine. A cautious press of the right button followed by a sigh of relief as the "Train Heat On" light came on for the first time in preservation. Well done to them! A little testing with actual coaches is to follow but all seems good so far. The Passenger Department did their usual Friday admin and the Pullman Painter did a coat of Lancastrian Cream on the coach that will be hauled by the 33. My pencil sharpener seized up today with the continuing sub zero temperatures but, amazingly, people continued to work to further our project. Work progressed the installation of power to the Information Centre and the interior of the enlarged EVRA shop. Also the Buffet Car benefited from further stripping out of the area to be occupied by the new serving area. 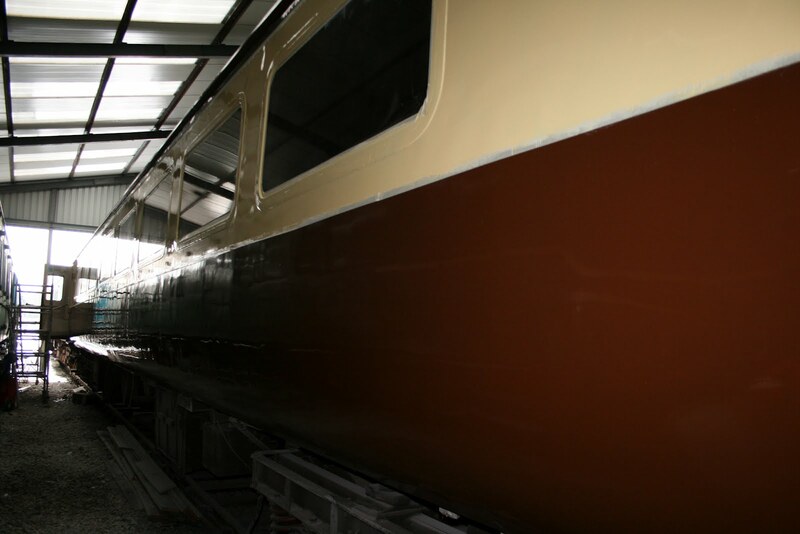 The former Gatwick Express Second Open had its final gloss Umber on the East side and both ends of the coach have received the first coat of Umber gloss. The VCT completed their work at Duffield and continued cutting and burning between Idridgehay and Shottle. The small, but perfectly formed, PWT managed to drill and plate 61 sleepers for the Shottle loop and also managed further tidying up of the lineside. The Duffield Toilet Team, benefiting from the warmer weather down south achieved the fitting of one new door that is lockable and installed the door frame for the second new doorway. A substantial delivery from Wickes was received towards this exciting project. The dmu team undertook maintenance on 51505 and reformed the three car set. The Booking Hall progressed our group booking enquiries. Great credit to all involved in what has been a most cold day. No international contacts today although there is a hint of a Scandinavian interest next week! The PWT had an active day as they shipped sanitary ware to Duffield, extension of the raised platform to Idridgehay and loaded brick rubble at Duffield. In between these activities they fastened more base plates down at Shottle, gathered logs for sale and burnt quantities of life expired sleepers as part of a general tidy up of the lineside. Despite the sub zero temperatures the Second Open repaint proceeded with the gloss Umber on the East side completed, preparation of the East side completed and some Umber undercoat applied. The lone Carriage Cleaner again had the assistance of Eric, on his birthday and that's dedication, and tended to seats on the three car set. (This was a very significant birthday for Eric but I promised not to mention it - happy 60th). Work continued on the EVRA shop and the Filing Fairy was in full flow. Amey and the SRS "cherry picker" returned to inspect bridges 22 and 24 and, again, were ably hosted by Tom Tait. The Booking Hall brought our group booking enquiries up to date and worked on the itinery for the up coming Heritage Railway Association visit.